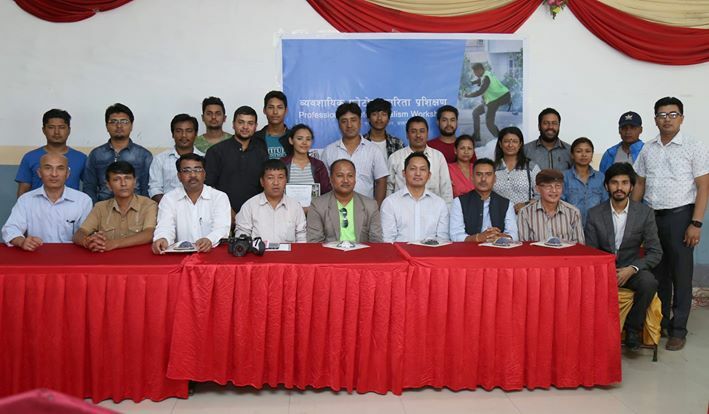 BHAKTAPUR, July 31: A five-day professional photo journalism training organized by the Bhaktapur Chapter of National Forum of Photo Journalists (NFPJ) concluded on Saturday. The training was imparted to journalists of Bhaktapur to equip them with knowledge and skills for professional photography. In the concluding session, Madhyapur Thimi municipality Mayor Madan Sundar Shrestha gave away certificates to training participants. Noting that a photo can speak louder than hundreds of words in writing, he said the municipality would take initiative to run a School of Photography keeping in mind the widening scope of photo journalism in the globe. On the occasion, NFPJ central chairperson Dhruba Ale stressed that the trained photo journalists should impart message of success in photography and establish their identity accordingly. Likewise, FNJ Bhaktapur chapter Chairperson Pushkar Raj Budhathoki asked the training journalists to materialize the training learning to their professional actions. Trainers including marketing manager of Canon for Bangladesh Sunil Tribhedi, Madhusudan Thapa, Sushila Sigdel and Chandra Chakradhare trained the journalists on photography and its use in journalism.